Denim, in the present days, has become one of the most promising categories in Indian apparel market. It has gone from a worth of INR 13,500 Cr in 2013 which accounted for total 5% of the apparel market of the country to a whopping worth of INR 27,200 Cr which accounts for 15% market in 2018. The Indian denim industry has shown continual growth over the years and currently, the country boasts of a denim manufacturing capacity of around 1.1 billion meters per annum. I have compiled a list of top denim manufacturing mills in India. 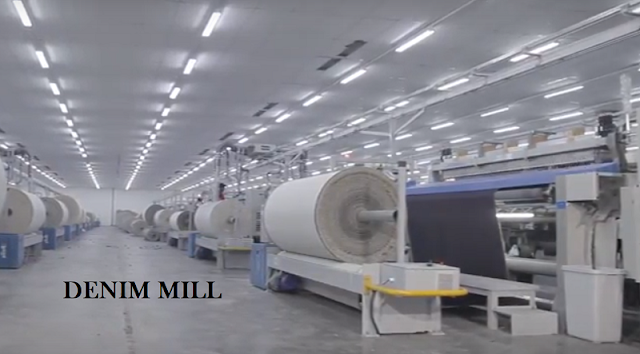 A little detail about the denim mills is provided along with their production capacity. I have also provided the website link of the manufacturers so that you can explore more about them. Garment manufacturers who need denim fabrics and denim suppliers for their denim products can source from these reputed and big mills. 1. Jindal Worldwide Limited was established around 70’s. They are the largest manufacturer with a production capacity of 120 million meters per annum which will be 160 million meters/annum by 2019 and 200 million meters per annum. Plant address-207, Saijpur Gopalpur, Opp. Lane of Piplaj, Narol Octroi Naka, N.H. 8, Ahmedabad - 382 445, Gujarat, INDIA. 2. Arvind Limited was established around 1931. They have a production capacity of 110 million meters/annum. In the last two decades, the company has become the world’s third largest manufacturer of denim. Plant address- Naroda Road, Gujrat, India- Ahmedabad-380025. 3. Aarvee Denims and Exports Ltd was established in 1988 by Arora & VB Groups with a capacity of about 85million meter/annum. Plant address-191 Moje Shahwadi, Narol-Sarkhej Highway, Nr. Old Octroi Naka, Narol, Ahmedabad-382 405. Gujarat, India. 4. Pratap Spintex Ltd was established in the 1970’s and has a production capacity of over 80 million meters per annum. They claim to be the only manufacturer to have a complete in-house product chain from raw cotton ginning to final garments. Plant address- 192 K.M. Stone, N.H. - 1, Mohra, Dist. Ambala Cantt., Haryana, India Pin: 133004. 5. Etco Denim Pvt Ltd was established in 2004 and has a capacity of around 50 million meters per annum. The company installed and commissioned modern spinning machinery and with intensive development and restructuring of operations, turned the company around into a profit-making unit in a short time. Plant address:142, Andheri Industrial Estate, Nr Janki Centre, Off. Veera Desai Road, Andheri (west) Mumbai - 400 053. 6. Raymond Denim started in 1996 with partnership from ‘Calitri’ of Italy. They have an annual global manufacturing capacity of up to 50 million meters of denim fabric. The company from the beginning has been strategically focused on top-quality, innovative, value-added denim fabrics. This has made Raymond a major denim player in the sub-continent. Plant address- Plot C-1, MIDC Yavatmal, Lohara village, Dist.Yavatmal, Maharastra (India) -445001. 7. Bhaskar Industries Limited is a Vertically Integrated Denim Mill, with spinning, weaving and finishing, under one roof, with an annual capacity of 44 million meters and started around 1998. Bhaskar Denim has a varied range of Fabric Blends, Weaves, colours, yarns and Finishes, to suit changing requirement of different Denim users. Plant address: Plot 15 -16, 'D' Sector, Industrial Area, Mandideep, Bhopal – 462046 (Madhya Pradesh), INDIA. 8. Suryalakshmi Cotton Mills Limited Founded in 1962, Suryalakshmi Cotton is a vertically integrated business leveraging five decades of successful spinning, denim and garment operations. They have a capacity of about 40 million meters per annum. Plant address- Surya Towers, 6th Floor, 105 Sardar Patel Road, Secunderabad - 500 003, Telangana, India. 9. KG Denim Limited is a premier denim and apparel fabric manufacturer, catering to leading fashion brands and retailers worldwide and has a production capacity of 36 million meters per annum. 10. Modern Denim Limited was established around 1991 and has a capacity of about 30million meters/annum. Modern Denim offers a wide range of high quality, basic and value-added Denim in accordance with customer’s specifications. Address-10 KM. Mile Stone, Sarkhej - Bavla N.H. 8 A, Village Moraiya, Ta. Sanand, Ahmedabad- 382210. (Gujarat) INDIA. 11. Mafatlal Industries Limited started around 1996 with Burlington Mills Inc., USA with a capacity of 30million meters/annum. From Shirting, Suiting, Denims, Corduroys, School, Corporate & Institutional Uniforms, Bed &Bath Linen and Ready-mades, each product at Mafatlal is an amalgamation of passion and research. Plant address- Vejalpore Road, (near Railway Station), Navsari-396445, Gujarat, India. 12. Ginni International Ltd started around 1996 and has a production capacity of 27 million meters/annum. Their mission is to attain industry leadership through the creation of sustainable economic value for our customers by an unflinching focus on creativity and quality in all our products. Plant address- SP2- (1A) & (2) RIICOIndustrial Area, Neemrana, Dist: Alwar (Rajasthan) INDIA. 13. LNJ Denim LNJ Denim, a denim-manufacturing facility established in 2007 under RSWM Limited (the flagship company of LNJ Bhilwara Group), has a manufacturing capacity of 25 million meters annually. LNJ Denim has earned an excellent reputation amongst international and domestic brands as an innovator and a quality supplier of denim fabric. Plant address- LNJ Nagar Village Mordi | PB No. 28, Distt- Banswara(Rajasthan) – 327001. 14. Soma Textiles & Industries Ltd was established around 1969 with a production capacity of 24 million meters/annum. The Company was one of the first units to manufacture indigo denim in 1986. Plant address- Rakhial Road, Ahmedabad – 380 023. GUJARAT (INDIA). 15. Century Textile and Industries Ltd has been around from 1897 but in 2008 the company added a vertically integrated textile plant with a capacity of 21million meters/annum. At present, it is a trendsetter in cotton textiles and also has a remarkable presence in the yarn, denim, viscose filament rayon yarn, tyre cords, caustic soda, sulphuric acid, salt, cement, and pulp and paper industries. Plant address- Century Bhavan, Dr Annie Besant Road, Worli, Mumbai 400030, Maharashtra, India. 16. Anubha Industries Pvt Ltd was founded in 2013 as a part of Pratibha Group. They have a capacity of 20million meters/annum. The company develops manufactures and supplies high-end sustainable fabrics including, denim, polyester, linen, viscose, nylon yarn, dispersed dyed and other technical Fabrics. These fabrics are used in various segments like denim, fashion, work-wear and sports. Address- Plot No - 369, 371, 377 - NH8, Village & Taluka Palsana, Surat - 394 315, Gujarat - India. 17. Ashima Group made its debut in 1982 and has a capacity of about 10.5million meters/annum. Address- Nr. Anupam Cinema, Khokhara, Ahmedabad – 380 02, India. 18. Nandan Exim Limited was established around 1994 under ‘Chiripal Group’ and has a production capacity of 10million meters/annum.